Completing a marathon takes determination and a commitment to months (and sometimes even years) of training. The sense of accomplishment, though, when crossing that finish line makes it all worthwhile, says Ewen North, head coach and director of Revolution Running in Boulder, Colo. “Not everyone in the world is capable of such a feat, and the dedication to training alone is an achievement in and of itself,” says North. “Twenty-six point two miles is a very long way, and getting through that can be a lifetime goal for many.” For those of you aspiring to run a marathon and those of you who are already accomplished marathoners, why not make your next race into the trip of a lifetime? Since marathons happen all around the world, it’s possible to run your race almost anywhere. 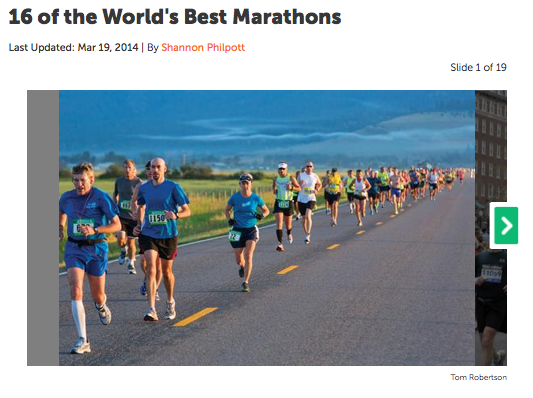 Read on to see 16 of the world’s best marathons, and get tips to start training and planning!